Nils and Dave wanted to re-create the green color of the Marennes oyster, but they also wanted to impart unique flavor. The natural culinary inclination is to pair oysters with some form of acidity, but with live-infusion, acidity will kill the oysters. Saltwater is basic, so any acidity at all would be a problem. First, they decided to try a broth of dashi & dill, which would both color the oysters and impart a distinct flavor. Next, they considered the salinity level of the broth. Luckily, Dave Arnold Hobby #612 just so happens to be keeping saltwater fish, so he had a bag of aquarium salt handy. We added just under the recommended dosage for saltwater in order to simulate the brackish water in which oysters feed. Finally, the broth temperature needed to be between 41-70°F (anything higher would make for potentially toxic conditions) so the oysters would be active and eating instead of hibernating. Normally you strain the kombu and bonito flakes from dashi broth, but we wanted the oysters to eat these solids and take on color. So we needed to find a way to make the kombu and bonito particles small enough for the oysters to actually be able to take them in. We used our Vita-Prep blender to blend the broth, bonito flakes, dill, and aquarium salt until the particles were as fine as possible. We poured the mixture into a medium-sized cambro, added the oysters (belly-side down) in a single layer, covered the container and put it in a dark, cool, and quiet corner. We waited 3-4 hours and then shucked one to take a look. Inside, the oyster was swimming in a greenish liquid—so far, so good. Next up was a taste test. Not so good, but at least the idea had worked. Dave took a closer look and noticed that the bonito and dill particles were actually too big and had gotten caught, clogging the gills and basically choking the oysters. Dave cold-called an oyster physiologist (who took his call and took his questions) about our experiment and got a few crucial facts for our next attempt: 1) the flavor infusion will occur over a period of time no longer than 4 hours—flavor comes from what’s in the gills and ingested, not digested; and 2) bacteria can breed in an oyster that is harmless to them, but toxic for humans, so don’t keep oysters in a captive tank too long. 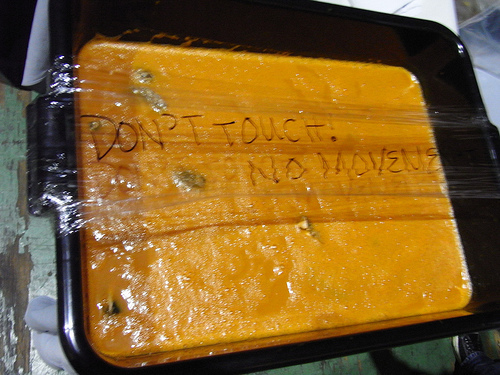 There was no specification for how long “too” long was, so we chose to adhere to the food code danger zone of no longer than 4 hours. Typically, we generally go no longer than 2 hours. The next idea was to try carrot and cardamom. We peeled, juiced, and strained a little over 25 lbs of carrots and added in ground cardamom. Then we added the aquarium salt and hit it with the rotor-stator homogenizer. Allow me to state for the record one more time, it’s important not to hold the rotor-stator at an angle… . Again, we laid the oysters, Duxbury this time, in a single layer, belly-side down, and put them aside for two hours. Jackpot. Nils popped open the first oyster, revealing bright orange liquid surrounding its belly. He tasted it—delicious. Then he added lime crème fraîche and a little paddlefish caviar (because Nils needs food to go beyond delicious) and the oyster was perfect. We’ve served this dish several times now, and can now successfully get 75% of the oysters to feed (we call this our “eat rate”). You can juice the carrots a day ahead, but it’s best to juice them fresh so you don’t get that woodsy, old carrot taste. We always cover the tank and put the oysters somewhere cool, quiet, and dark to encourage them to start chowing down on the liquid surrounding them. In case you skipped ahead and are just reading this summary, we also learned not to put the rotor-stator homogenizer into the juice at an angle, since it will splash out and cover anyone near it with carrot juice (thanks, Dave). Finally, we’ve used the same technique to make French Onion Soup Clams. We cooked, strained, and chilled French Onion soup (with added bacon and Gruyère rinds), hit it with aquarium salt and the rotor-stator, then let Littlenecks hang out in it for 2 hours. The result is amazing—the Gruyère and bacon complement the natural salty, briny taste in the clams while the onion brings out the sweetness. It’s my personal favorite. This is seriously the best blog out there…keep this going, full force. Thanks – please keep reading. We appreciate your interest & support! If one doesn’t have a homogenizer, would infusions or clarified liquids work? Good question. I assume yes. If something is clear I would assume the particle size is below 10 microns (the gill-choking point). Anyone knows how many microns a PacoJet gives ? It’s supposed to shave no more than 2 microns per rpm. Geez Chris, I don’t know. Anyone out there know the gearing on a PacoJet? This is fantastic! Not something to try at home (I don’t think) but now I want one – a carrot and cardamom oyster. The only issue is that mussels are usually cooked, so you could just add the flavor to the cooking broth. It works on clams. What are the specs on your homogenizer? I am very interested in procuring one. Love this technique! We work literally on the beach, so we took some ocean water, smoked it, and once we strained and sterilized the water, soaked the oysters in them and wound up with live smoked oysters. Would love your input on this… we found that after smoking, the oysters seemed to live longer. Before this, they only held for 3 days or so, but at this point, we’re able to keep them for over a week. 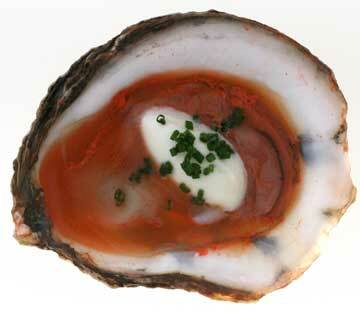 Is there something in the act of smoking this oyster that might inhibit bacteria growth? We’re also trying some saffron infused oysters, mainly for the color. Seems like our feed rate is only 1 out of 3 though, although both the saffron color as well as the smoke flavor seem to intensify as the days go on. Was thinking about using or including some fat or protein somehow as a carrier for the saffron color/flavor. Any thoughts on whether this would work? Hoping to play with this soon, but you know how it goes; in a busy restaurant kitchen, time is the most valuable resource. Such a great idea; thanks for being such a wonderful source of inspiration! Thanks for the kind words and the input. I have never tried smoke on oysters because I thought it would be too much of an irritant to them (although I have tried bacon on cherrystones). Glad I was wrong. Dunno why they live longer. Very cool. Saffron is interesting. I don’t think of it as an irritant, but there must be something the oysters don’t like (I assume you were straining and the oysters weren’t just rejecting the particles). To use fat as a carrier, it would have to be emulsified into the seawater. I don’t know how the oysters would react to an emulsion because the viscosity would be quite different from ordinary water. I would use something like Ticaloid 210S (gum arabic and xanthan mix from TIC gums) to do the emulsifying, but it would definitely add body to the liquid. Please keep me informed of your progress. This is not an expert opinion. But maybe the extended life span has something to do with your having sterilized the water; perhaps this cleansing bath eliminates most vectors of infection not only in the oyster’s environment but in the oyster itself. Just a guess, really. Also, where is your restaurant? Smoked live oysters sound delectable. Chefs, this is the best blog ever. About oysters, once I shucked them, can I keep in its liquid for a day, two, three and still serve them? I don’t know how they’d taste Marcio, I’ve never saved them. Maybe someone else on the blog has tried?